192 pages | 7 B/W Illus. This book examines the imaginative narratives that shaped the attitudes of Americans (and others) toward Japan. Focusing on cultural aspects of economic nationalism and US-Japan relations during the trade war Marie Thorsten uses examples from public discourse, film, documentaries, novels, acts of racism and comparison of international education assessments to examine the way in which Japan has been constituted in a global political gaze as an economic hegemon. In times of heightened rivalry, we often try to find superior "others" so that we can motivate ourselves against an imagined future of decline. During the Cold War, Americans and other nations in the West took advantage of being the underdog against the perceived superiority of the Soviet Union, especially by turning the Sputnik launch of 1957 into a lodestone for an educational renaissance. As postwar Japanese power became increasingly threatening, American policymakers again tried to fashion Japan into another "Sputnik" to motivate American people. This book explores 1980s "Bubble" Japan as a "Superhuman Other" in the consciousness of Americans, especially as reflected in popular culture and policy discourses. Making Japan into a Superhuman often resorted into the same stereotyping that invented Japan as a Subhuman. It was difficult for many to see that America, Japan and other nations were actually sharing the same global economic circumstances affecting attitudes toward knowledge and nation. This book will be of interest to students and scholars of Japanese politics, International Relations and Japanese culture and society. 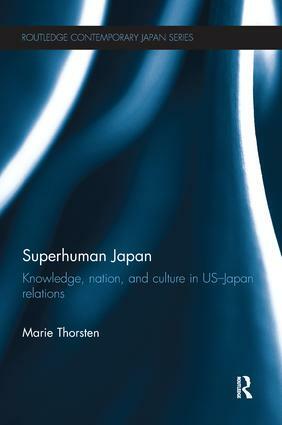 Marie Thorsten is Associate Professor of Global Communications at Doshisha University in Kyoto, Japan where she researches and teaches courses in global and cultural studies.